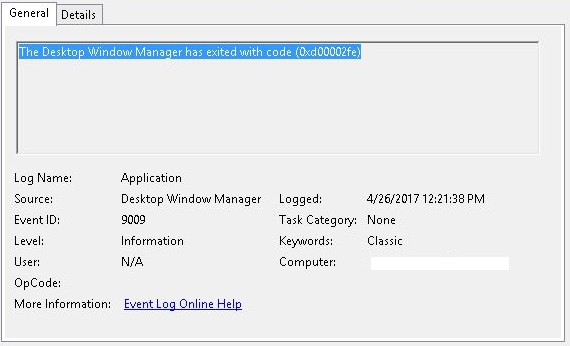 Early in my DFIR career, I struggled with understanding how exactly to identify and understand all the RDP-related Windows Event Logs. I would read a few things here and there, think I understood it, then move on to the next case – repeating the same loop over and over again and never really acquiring full comprehension. That is until one day I finally got tired of repeating the same questions/research and just made a cheat sheet laying out the most common RDP-related Event ID’s that I’d encountered along with their relevance and descriptions. From that point on, as I sporadically encountered related questions/confusion from others in the community, I would simply refer to my cheat sheet to provide an immediate response or clarification – saving them from the hours of repeated questioning and research I had already done. 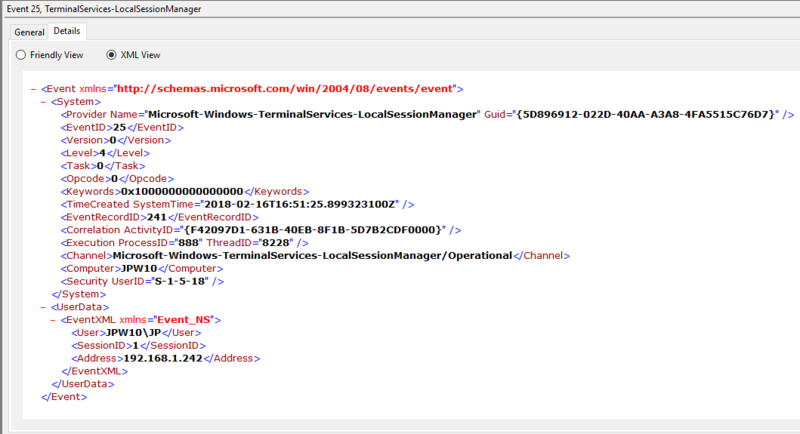 However, it seems the community continues to encounter the same struggle in identifying and understanding RDP-related Windows Event Log ID’s, where each is located, and even what some of them mean (no thanks to some of Microsoft’s very confusing documentation and descriptions). As such, I recently set out to try and find an easy route to the solution for this problem (i.e. hopefully find a single website to point to with all this information). Though I’ve found parts of the answer in posts here and there, each of them were missing parts of the puzzle (either missing ID’s, descriptions, explanations, and/or overall how they fit together in a chronological fashion). I will say JPCERTCC did an awesome job capturing a ton of information here, I just can’t quite decipher or discern the clear order of events and some appear out of order (at least how I have encountered them, but maybe I’m reading it wrong…). At any rate, as they say, necessity is the mother of invention. 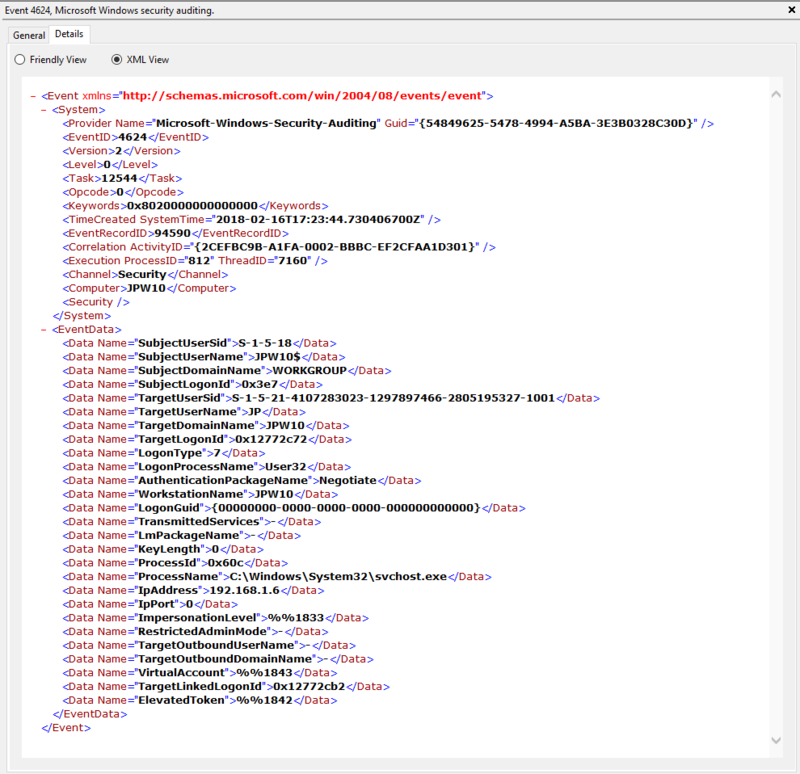 So, I decided to create a blog post that I hope can serve as a succinct one-stop shop for understanding and identifying the most commonly encountered and empirically useful* RDP-related Windows Event Log ID’s/entries for tracking and investigating RDP usage on a Windows Vista+ endpoint. The Windows Event ID’s in the XP days were different than those in Vista+ Operating Systems. So, I decided to leave those out for now, but perhaps I will add them in the future. 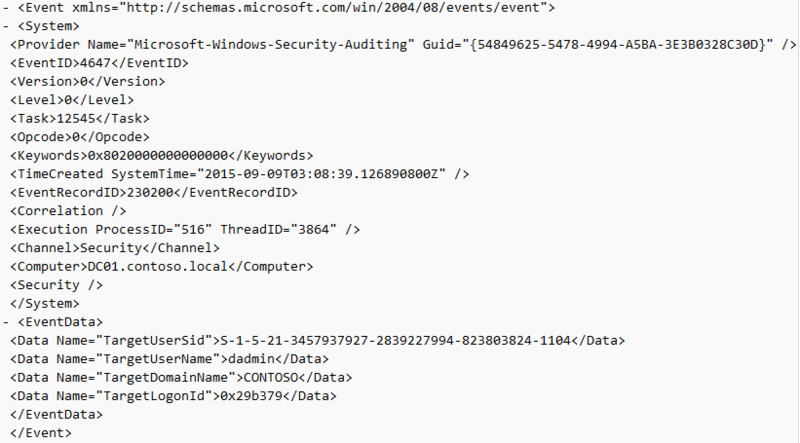 *Yes, there are Event ID’s like 1146, 1147, and 1148 which look great in Microsoft’s documentation as a very useful source of information. However, I’ve yet to see (m)any of these commonly occurring in the wild. This section covers the first indications of an RDP logon – the initial network connection to a machine. Notes: Despite this seemingly clear-cut description, this event actually DOES NOT indicate a successful user authentication in the sense that many might expect (e.g., successful input and acceptance of a username and password). Instead, “authentication” in this sense is referring to successful network authentication, as in someone successfully executed an RDP network connection to the target machine and it successfully responded and displayed a login window for the next step of entering credentials. For example, if I launched the RDP Desktop Connection program on my computer, input a target IP, and hit enter, it would simply display the target system’s screen and produce an 1149 Event ID indicating I had successfully connected to the target, WELL BEFORE I even entered any credentials. 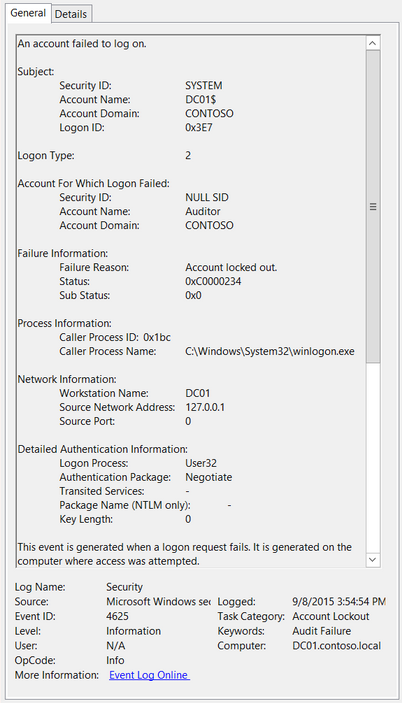 So, repeat after me, “An Event ID 1149 DOES NOT indicate successful authentication to a target, simply a successful RDP network connection”. TL;DR: NOT AN AUTHENTICATION. 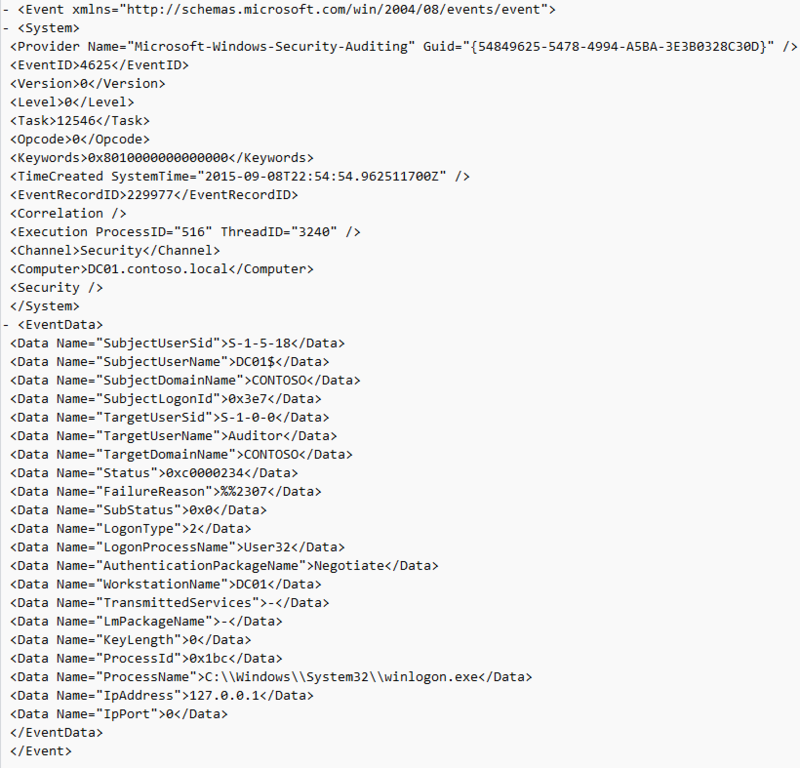 Someone launched an RDP client, specified the target machine (possibly with a username and domain), and hit enter to make a successful network connection to the target. Nothing more, nothing less. 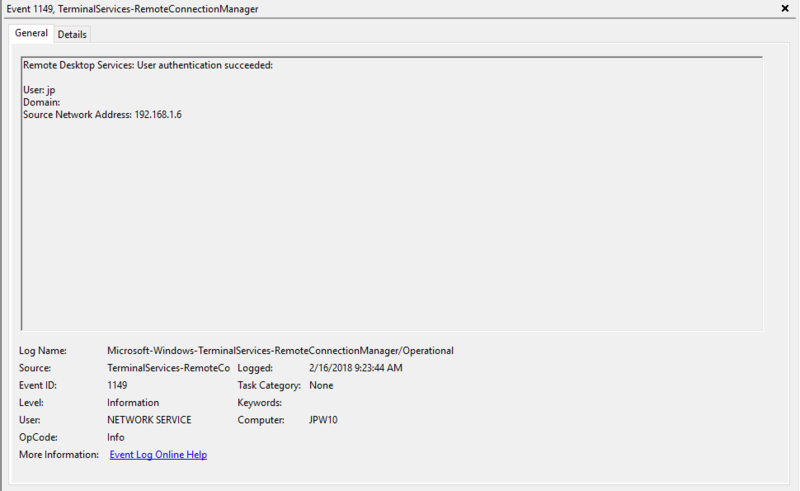 This section covers the authentication portion of the RDP connection – whether or not the logon is allowed based on success/failure of username/password combo. Notes: I thought this one was pretty straight forward – just look for Type 10 logons for RDP. However, in a bit more research, I discovered that RDP’ing to a system of which you’d previously RDP’ed and not formally logged off/out would instead yield a Logon Type 7 logon versus the Logon Type 10 we’d expect. 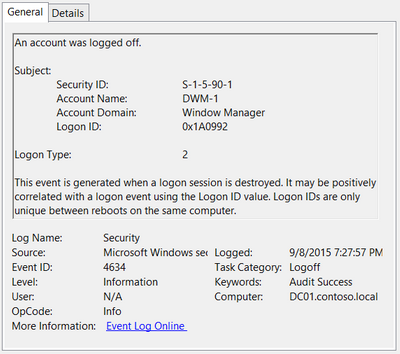 This makes sense in a way in that a Logon Type 7 (“This workstation was unlocked”) is essentially what is happening. However, to delineate this from non-RDP Type 7 logons in which a person was sitting at the machine and just unlocked the machine, we can look for remote non-local IP’s in the IpAddress field. TL;DR: User successfully logged on to this system with the specified TargetUserName and TargetDomainName from the specified IpAddress. Notes: Why do we care about failures? Well, this is helpful in identifying (brute force) failure attempts and seeing when/where an attacker may be attempting stolen/compromised credentials. The Status/Sub Status Code will also be helpful in delineating legitimate failures (e.g. “expired password”) as well as possibly providing insight into attacker activity (e.g. repetitive “user name does not exist” codes could indicate brute force guessing by a tool and/or a more targeted lack of username knowledge/awareness in the environment by the attacker). TL;DR: User failed to log on to this system with the specified TargetUserName and TargetDomainName from the specified IpAddress. #ProTip: Both of these entries also contain a “TargetLogonID” field. This ID is unique for each logon session and is also present in various other Event Log entries, making it theoretically useful for tracking/delineating a specific user’s activities, particularly on systems allowing multiple logged on users. 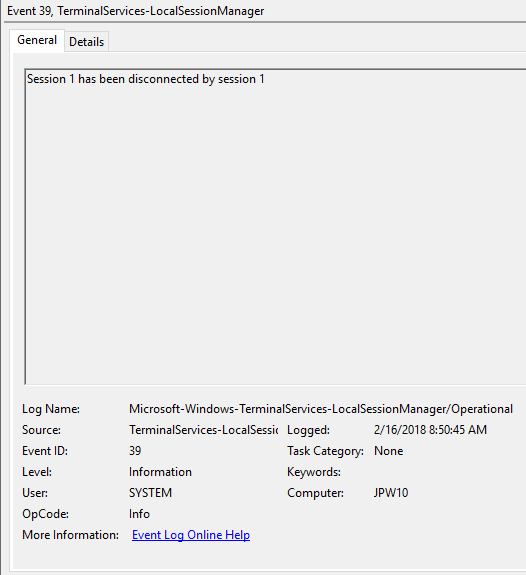 However, do take note that a unique TargetLogonID is assigned for each session, meaning if a user connects, then disconnects (without logging out, thus simply ending the current session), then reconnects (i.e. starting a new session), they will be assigned a different unique TargetLogonID. All to say that a single user(name) may have multiple unique TargetLogonID’s to track depending how many sessions they’ve instantiated, not to mention Windows makes it very confusing sometimes with multiple 4624’s with different TargetLogonID’s for the same session. So, YMMV. This section covers the ensuing (post-authentication) events that occur upon successful authentication and logon to the system. Notes: This typically immediately precedes an Event ID 22 when the “Source Network Address” contains a remote IP address. A “Source Network Address” of “LOCAL” simply indicates a local logon and does NOT indicate a remote RDP logon. 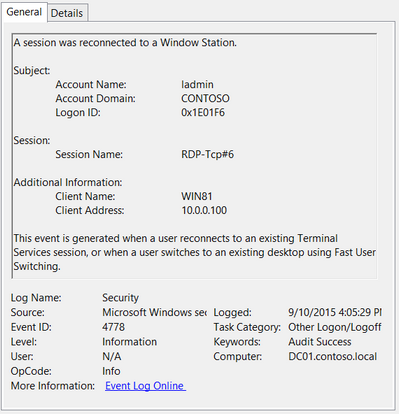 For remote RDP logons, take note of the SessionID as a means of tracking/associating additional Event Log activity with this user’s RDP session. TL;DR: Indicates successful RDP logon and session instantiation, so long as the “Source Network Address” is NOT “LOCAL”. Notes: This typically immediately proceeds an Event ID 21. Note that a “Source Network Address” of “LOCAL” simply indicates a local logon and does NOT indicate a remote RDP logon. TL;DR: Indicates successful RDP logon and shell (i.e. Windows GUI Desktop) start, so long as the “Source Network Address” is NOT “LOCAL”. 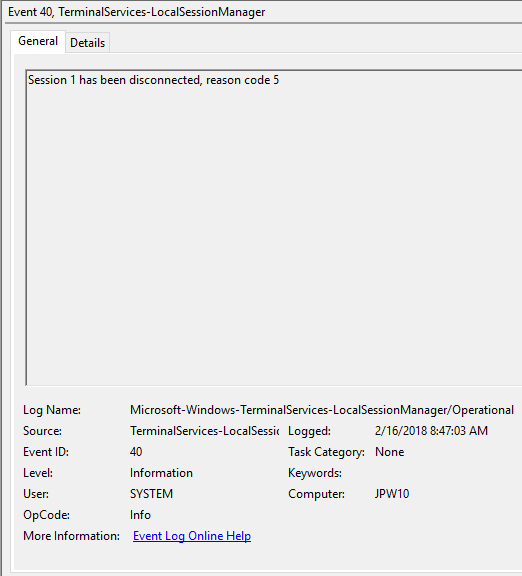 This section covers the various session disconnect/reconnect events that might occur due to either system (idle), network (network disconnect), or purposeful user (X out of the RDP window, Start -> Disconnect, Kicked off by another user, etc.) action. 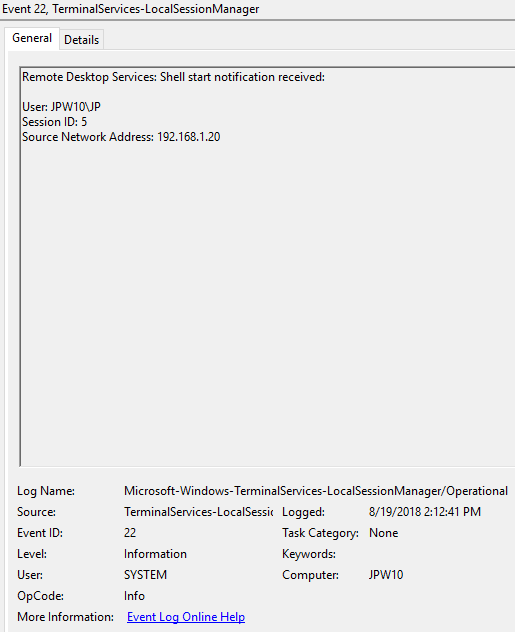 Notes: The user has disconnected from an RDP session, when the “Source Network Address” contains a remote IP address. A “Source Network Address” of “LOCAL” simply indicates a local session disconnection and does NOT indicate a remote RDP disconnection. Note the “Source Network Address” for the source of the RDP connection. This is typically paired with an Event ID 40. 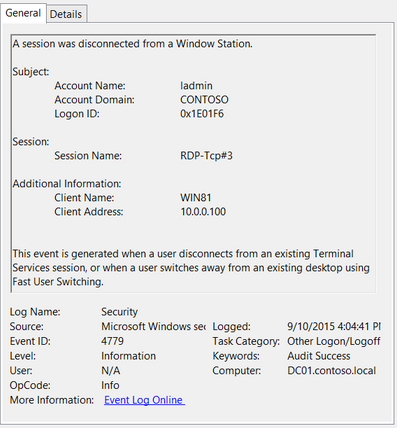 Also take note of the SessionID as a means of tracking/associating additional Event Log activity with this user’s RDP session. TL;DR: The user has disconnected from an RDP session, so long as the “Source Network Address” is NOT “LOCAL”. Notes: The user has reconnected to an RDP session, when the “Source Network Address” contains a remote IP address. 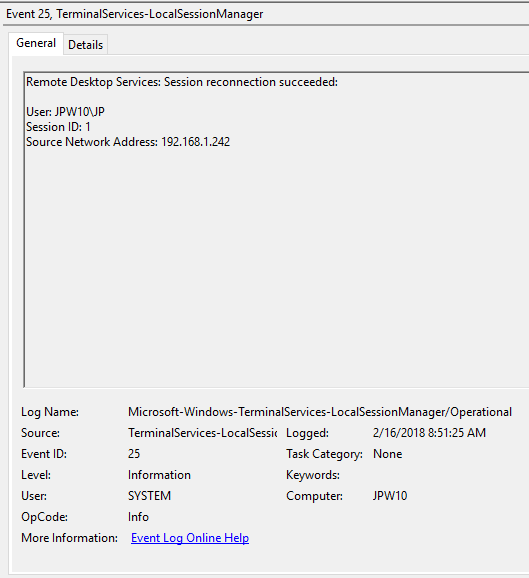 A “Source Network Address” of “LOCAL” simply indicates a local session reconnection and does NOT indicate a remote RDP session reconnection. Note the “Source Network Address” for the source of the RDP connection. This is typically paired with an Event ID 40. 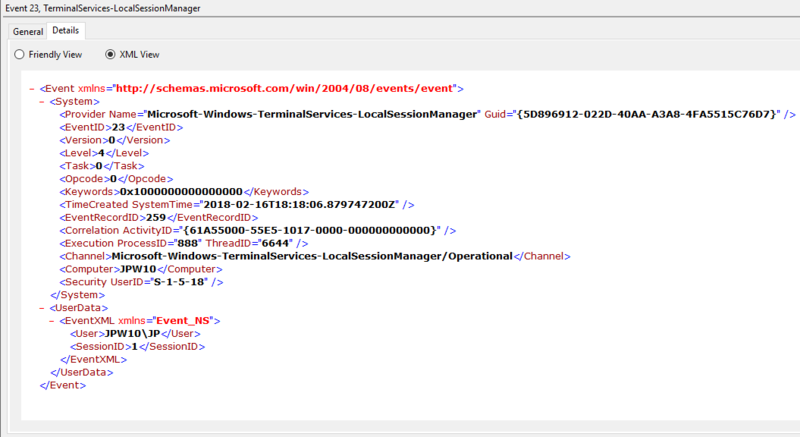 Take note of the SessionID as a means of tracking/associating additional Event Log activity with this user’s RDP session. TL;DR: The user has reconnected to an existing RDP session, so long as the “Source Network Address” is NOT “LOCAL”. Notes: This indicates that a user has formally disconnected from an RDP session via purposeful Disconnect (e.g., via the Windows Start Menu Disconnect option) versus simply X’ing out of the RDP window. 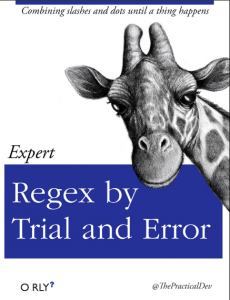 Cases where the Session ID of <X> differs from <Y> may indicate a separate RDP session has disconnected (i.e. kicked off) the given user. TL;DR: The user formally disconnected from the RDP session. 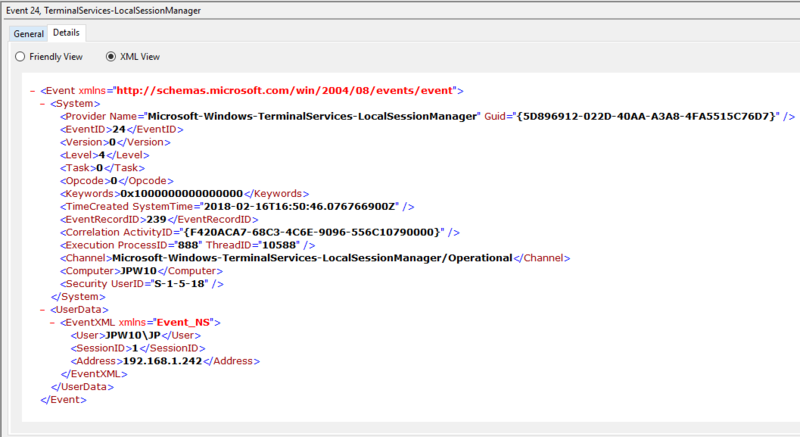 Notes: In true Microsoft fashion, although the description is always “Session has been disconnected”, these events also indicate/correlate to reconnections, not just disconnections. The most helpful information here is the Reason Code (a function of the IMsRdpClient::ExtendedDisconnectReason property), the list of which can be seen here (and this pairs it with the codes to make it easier to read). Below are some examples of codes I encountered during my research. TL;DR: The user disconnected from or reconnected to an RDP session. Notes: Occurs when a user reconnects to an existing RDP session. Typically paired with Event ID 25. 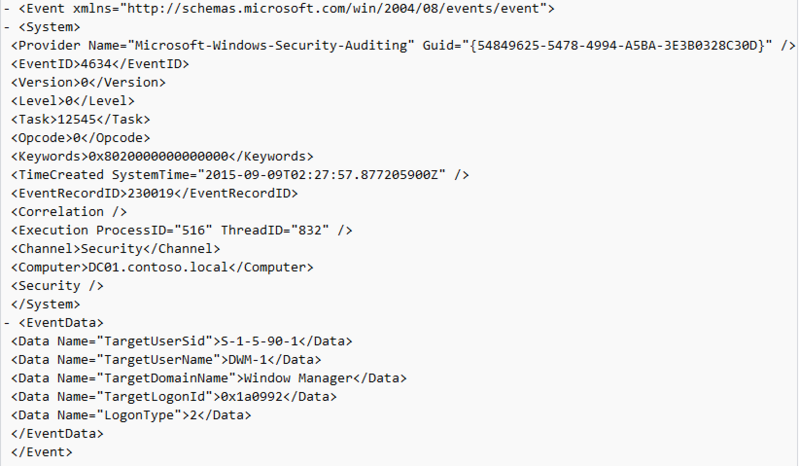 The SessionName, ClientAddress, and LogonID can all be useful for identifying the source and associated activity. TL;DR: The user reconnected to an existing RDP session. Notes: Occurs when a user disconnects from an RDP session. Typically paired with Event ID 24 and likely Event ID’s 39 and 40. The SessionName, ClientAddress, and LogonID can all be useful for identifying the source and associated activity. TL;DR: The user disconnected from from an RDP session. This section covers the events that occur after a purposeful (Start -> Disconnect, Start -> Logoff) logoff. Notes: The user has initiated a logoff. 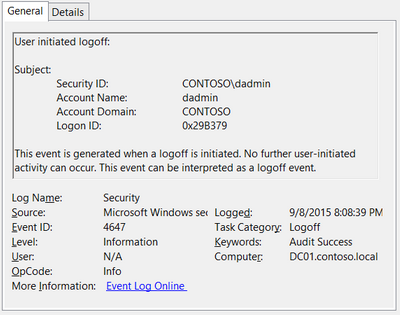 This is typically paired with an Event ID 4634 (logoff). 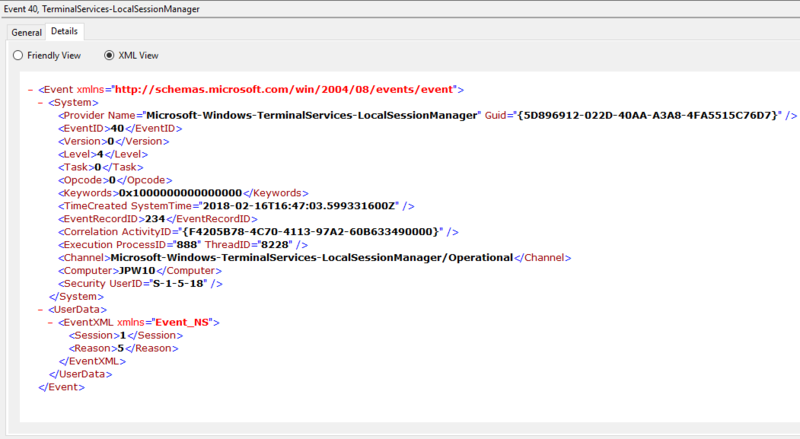 Take note of the SessionID as a means of tracking/associating additional Event Log activity with this user’s RDP session. TL;DR: The user initiated a formal system logoff (versus a simple session disconnect). 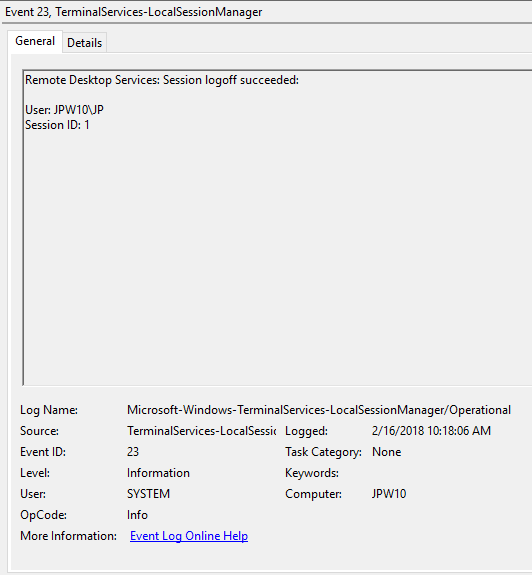 Notes: These occur whenever a user simply disconnects from an RDP session or formally logs off (via Windows Start Menu Logoff). 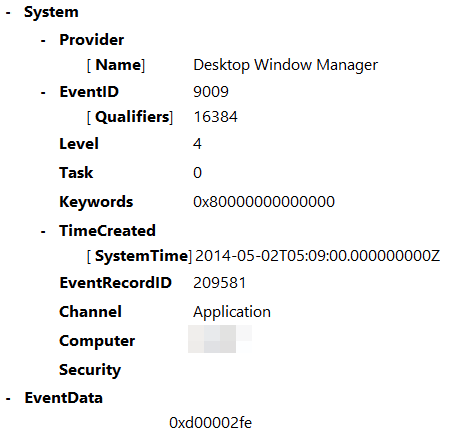 This is typically paired with an Event ID 21 (RDP Session Logoff). I’ve also discovered these will also be paired (i.e. 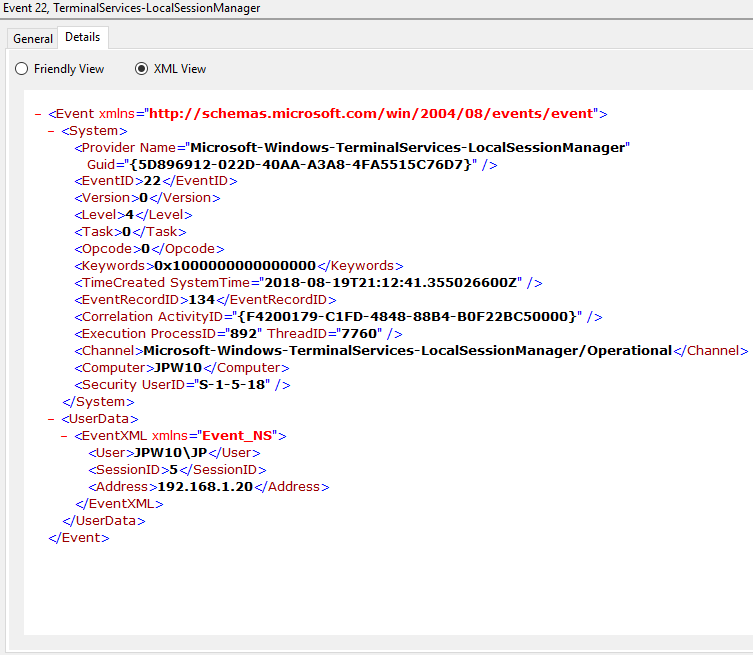 occur at the same time) with successful authentications (Event ID 4624). Why, I have no idea. TL;DR: A user disconnected from, or logged off, an RDP session. Notes: Occurs when a user initiates a formal system logoff and is not necessarily RDP specific. 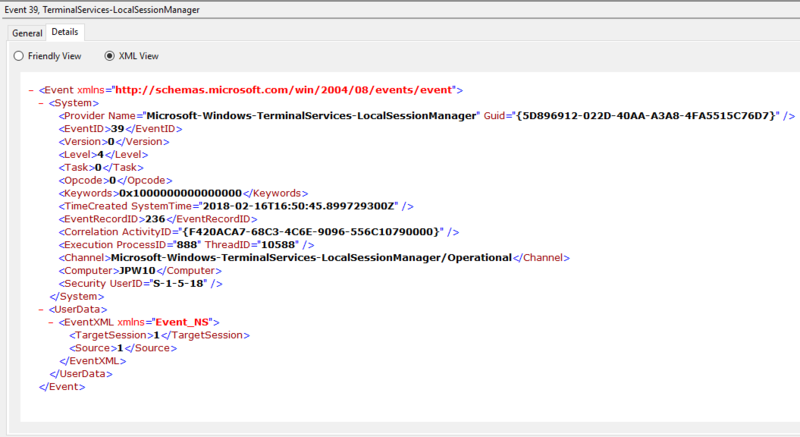 You will need to use some reasoning and temporal analysis to understand if/when it is related to a system logoff via an RDP session or is from a local interactive session as there is no LogonType associated specify which it is. TL;DR: The user initiated a formal logoff (NOT a simple disconnect). 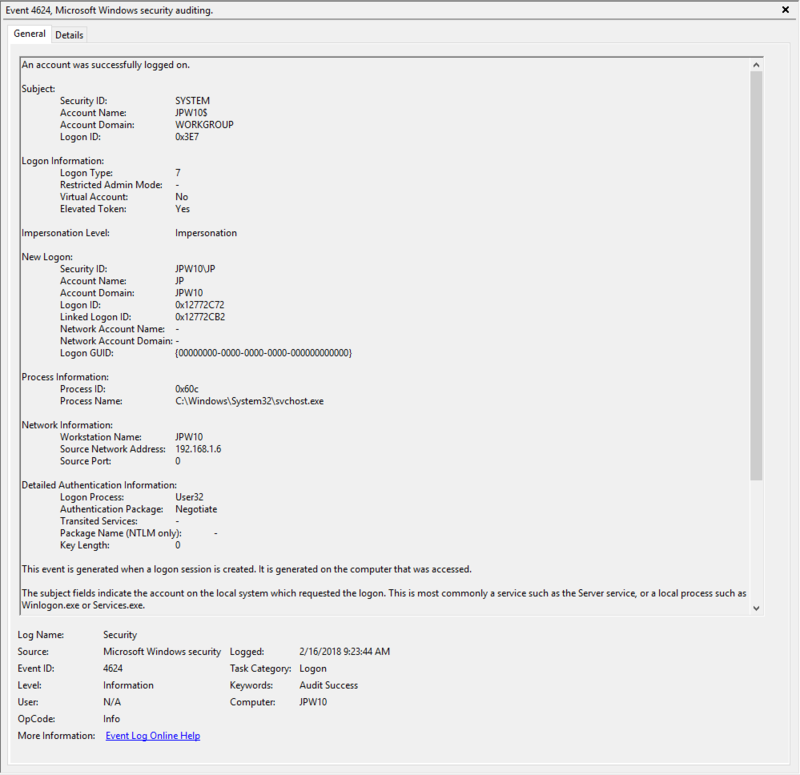 Notes: Occurs when a user formally closes an RDP connection and indicates the RDP desktop GUI has been shut down as a result. 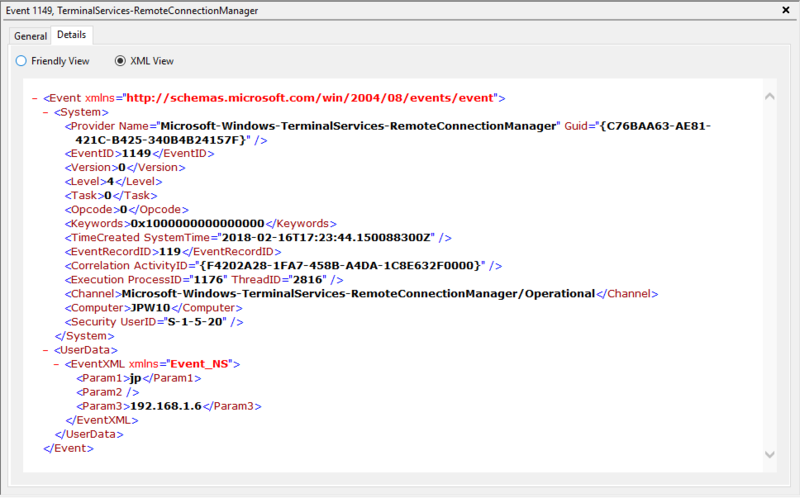 This is useful to identify a closed/finalized RDP connection. Though, this event is not always produced for reasons I do not know. TL;DR: A user has closed out an RDP connection. 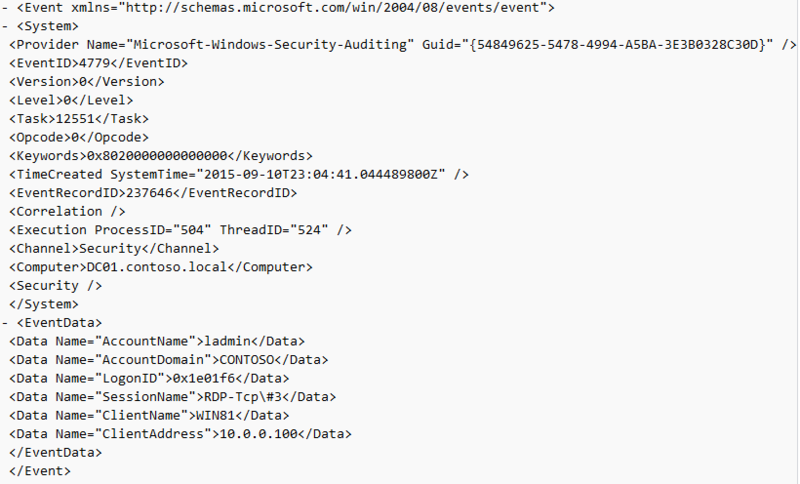 Hopefully that provides a little better insight into some of the most common and (IME) most empirically useful RDP-related Event logs, when/where you might encounter them, what they mean, what they look like, and (most importantly) how they all fit together. In consulting, all engagements begin with what we refer to as “scoping” in order to, at a very high level, determine if/how we may be able to help a client. Sure, they can sometimes be arduous or monotonous and often involve a comedy of conference call errors, but they are absolutely CRITICAL to the success of the engagement. So critical, in fact, that I wanted to take some purposeful time to address this often-overlooked, admittedly very unsexy, but nonetheless integral piece of performing effective DFIR. Though I’m approaching this from a consulting point of view, this is in no way unique nor applicable only to consulting. So, don’t tune out now just because, “I don’t have clients.” You do, actually, whether they are external entities or people within your own organization. Each of us has “clients” in various forms that rely (often heavily) on us as DFIR professionals to ask the right questions and respond with the appropriate guidance and/or actions to mitigate threats and protect them from harm. As such, every DFIR professional will find themselves in situations where they must first comprehensively understand the problem(s) and issue(s) at hand before it can be effectively addressed in response and analysis. In fact, this is often where many of us find ourselves at the onset of an alert or suspected compromise that requires a well-formulated and concerted DFIR response. Though it can be very difficult to take step back and perform a high level assessment instead of diving right into action (especially when you may have external entities and/or higher level management wanting answers LIKE YESTERDAY), doing so will pay you back ten-fold. At a lower level, scoping (or an initial assessment) must be performed as a due diligence effort to acquire all appropriate/pertinent information, addressing a variety of aspects that may affect the success, efficacy, or efficiency of the investigation. From my private sector experience dealing with a wide array of clients from all types of verticals, industries, and organizational sizes, I’ve attempted to unjustly distill the scoping topic and question set down a few (ok, a few more than a few) important bullets provided below. However, do keep in mind that this is not intended to be all-inclusive set of questions to ask by any means. Rather, the below set of topics and specific questions are intended to serve as a solid baseline in facilitating comprehensive response and should be augmented or modified as needed. In addition, the below questions are from the perspective of me/us asking an external entity (i.e. client). So, feel free to change/replace the pronouns as well as instances of “the client” as needed for your use and application. How did we (the client/organization) get here? When and how did they first notice any sort of issue? Can they think of any legitimate (non-malicious) causes for the current issue? Have there been any other anomalies either previous to or during the timeframe of concern that may be related to the current issue? Are the systems still running or have they been powered down? Have firewall blocks been put in place? Have any external entities been notified (particularly if under certain regulations)? What type(s) of machines are involved (workstations/servers, OS)? Are they virtual or physical? Where are they hosted, and do they span disparate physical locations? What specific logging is enabled (host, network, and appliance)? …and which of the above are actually collected and available? 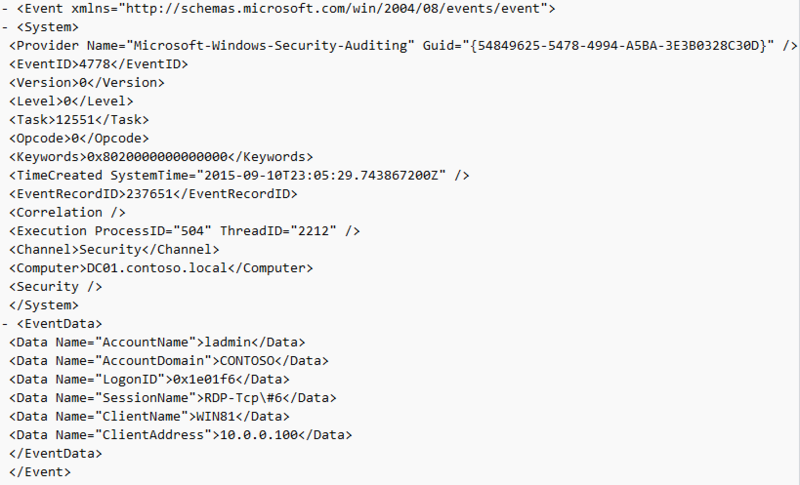 …and do the available logs contain the right (useful) content? Let’s just say it is not uncommon to get “VPN logs” that simply show syslog interface up/down, “Web Logs” that contain only the load balancer as the “client-ip”, or “DNS logs” that aren’t logging query/response and logging only the IP of the DNS server as the “client”. …and do the available logs span the time frame(s) of concern/interest? Is the client interested in simply getting back to business? Would they like a root cause analysis (how exactly did this get in/past their defenses)? If so, are they looking to specifically prove/disprove something? Are they simply looking to check a box (fulfilling some sort of requirement)? Often this will not be stated, but you can determine it by asking certain questions and gauging certain entities’ investment in the response. What would they like us to do, specifically, in priority order? Now, we don’t take this verbatim and slap it into a SoW, but we do use it to guide our response as best as possible to achieve their priority goals in tandem with an appropriate, comprehensive, and best practice response. Though it is not uncommon for a situation to merit even further questioning and level of excruciating detail, depending on complexity, the above set of topics are what I would consider the minimum requirements for a comprehensive initial assessment. Suffice to say that misunderstandings or simple lack of required information in any one of these areas can lead to a variety of undesirable consequences, ranging from that of a simply sub-optimal outcome to that of a completely disastrous one for both the company and the client. The DFIR industry is a “pay now or pay later” industry, and this is no exception. As such, I highly encourage all of us to be purposeful in spending our time performing due diligence on the front end instead of paying the consequences of not doing so throughout our investigations.